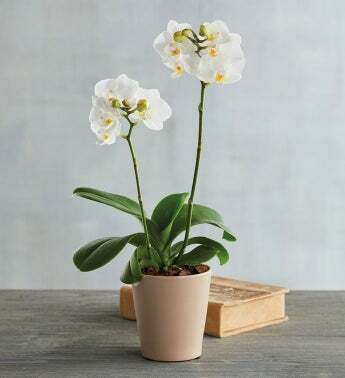 Add stunning beauty to your home or office décor with this elegant two-spike white orchid. Delicate white petals pop against rich green leaves for a breathtaking presentation, emerging out of a champagne-beige ceramic pot. This stunning orchid also makes a thoughtful gift for a friend or family member.